Garmin’s Dash Cam 20 really ought to have a different name, given that it doesn’t sit on the dash but hangs from the windscreen instead. Dangle Cam was presumably vetoed by the marketing department. 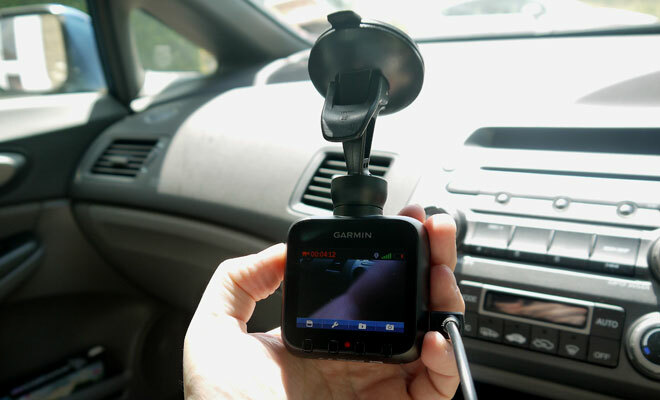 Names aside, Garmin’s Dash Cam has been designed to sucker unobtrusively onto your windscreen and record your journeys. It’s ready to go out of the box, and will record by default in 1080p video. It captures 30 frames per second with mono sound, also stamping speed and GPS co-ordinates onto every video frame. The device has a recommended price a penny under £200, but can be bought for a little bit less from Amazon and similar e-commerce outlets. That seems a lot for something you might hope you’ll never need. The Dash Cam’s job is to bear witness to accidents, providing impartial evidence about who was doing what immediately prior to things becoming pear-shaped. 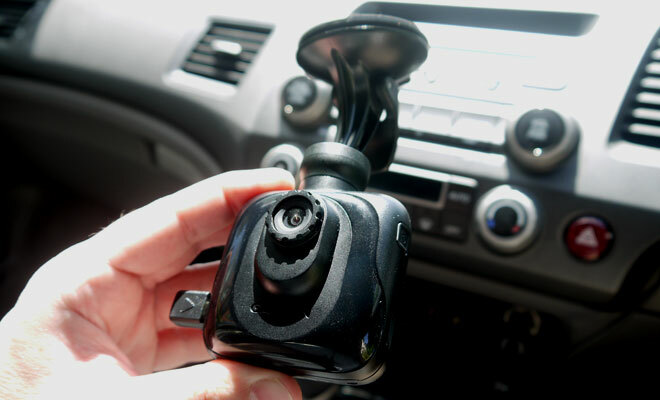 The device itself feels sturdily built and attaches firmly to the windscreen once assembled onto its sucker arm. Recording starts automatically on power-up and the 2.3-inch screen allows you to see exactly what the camera sees. The ball-and-socket arm then provides a wide range of adjustment to get the frame just right. Once set, the cam stays firmly in position, resisting the urge to sag under the weight of its power cable. After a minute or so, the screen dims to cut power consumption and reduce distractions, waking up only to issue alerts about upcoming speed cameras. The power cable itself is probably the least satisfactory part of the setup. To get a good view, the camera needs to be positioned fairly high up the windscreen, which means a long section of dangling flex down to your 12V socket. The orientation of the power socket on the side of the box also means that the cable juts out horizontally, rather than hanging vertically down. Finally, there’s the problem of powering the device if you also intend using an aftermarket satnav or smartphone for route guidance. You’ll likely need a socket doubler to run both, or will need to charge one device up beforehand so it can run on batteries. The Dash Cam 20 can manage about an hour on its internal lithium-ion cells. Rather than record one enormous file per journey, the Dash Cam slices its videos into 255MB chunks, which corresponds to 3 minutes 52 seconds at default settings. And as well as a GPS receiver for measuring speed and position, the Dash Cam 20 also boasts a shock sensor, enabling it to judge when you might have experienced an unwelcome knock. Normally, the Dash Cam will fill up its storage card in a loop, overwriting the oldest files. But when it senses a sufficiently sharp bump it will let out a very loud warning chime and mark the video as protected. You can also prod a button to save the current file if something just happened that you’d like to keep. The shock sensor arrives set to the middle of three sensitivity settings, but I found it a little too keen to spot noteworthy incidents at every pothole or drain cover. This creates two problems: firstly, the alert sound is very loud and very annoying, and secondly, the storage card quickly fills up with protected files, causing the device to start wailing like an infant when it runs out of room. The box arrives with a 4GB Micro SD card that can hold only 15 protected files, or just under an hour of video. The maximum storage the Dash Cam 20 can work with is 32GB. 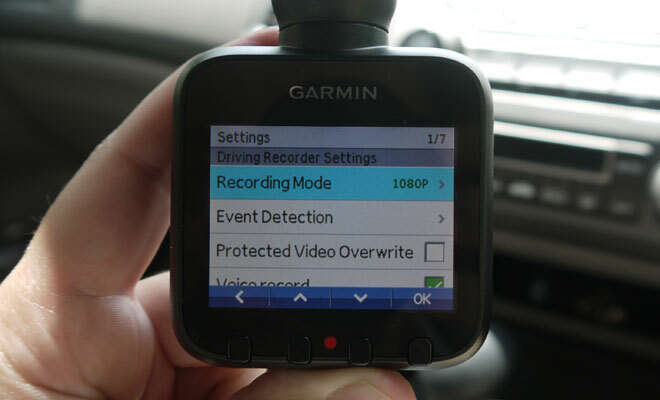 There are several ways to address the Dash Cam’s tendency to cry wolf. You can turn down the sensitivity, buy a bigger storage card, or instruct the Dash Cam to overwrite protected files. Adjusting the settings is done via a clear if not especially friendly set of menus accessed by prodding the button marked with a spanner. Video files are stored in .avi format, and you can review and delete files using the device itself. Helpfully, an adapter is supplied to allow you to slot the tiny Micro SD card into the much larger SD slots common on laptops. This makes it easy to import files and create space on the storage card, though my Windows 8 PC was not able to play the Garmin videos by default. Suitable software for Mac and PC is available from the Garmin website, which not only plays video but helpfully brings up the recorded route on a map and can display the direction and severity of any measured shocks. For some reason the software would not play back the sound on my videos, though this was safely recorded and playable through the device itself – and through YouTube, after I’d uploaded a sample video. You can watch that sample video below, filmed while testing the Ford Focus electric car I reviewed a couple of weeks ago. 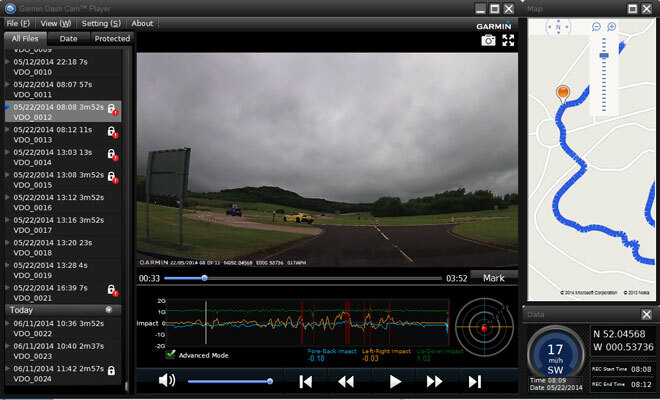 Click the gearwheel settings symbol on the video player and set quality to 1080p to see the resolution captured by the Dash Cam 20. The video is nicely crisp and detailed, and the camera does a reasonable job of adjusting the exposure to compensate for changes in lighting. The view is wide angle, though perhaps not wide enough to record potential incidents at T-junctions – notably the so-called flash-for-cash insurance fraud where another motorist kindly waves you out and then drives into you. 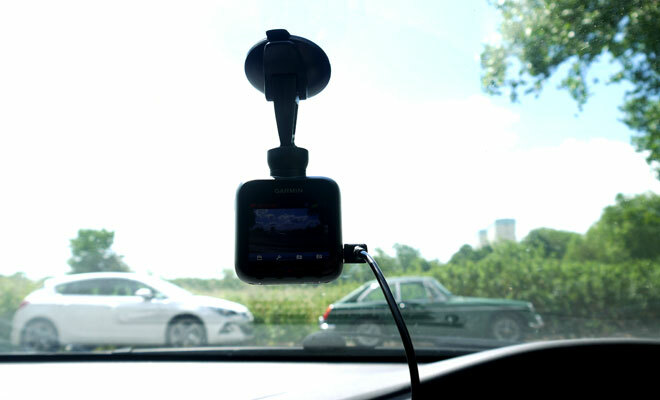 For most motorists worried by such scams, the Dash Cam will provide a reasonable level of reassurance that any claims will not be settled in favour of the fraudster. Plus, there is always the vague prospect that you might capture an interesting incident that will make you the next YouTube sensation.